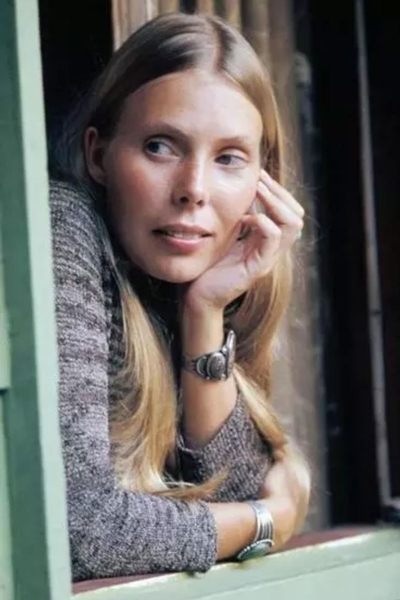 For many, the formative period of Joni Mitchell’s career, from the late 1960s to the late 1970s, is a countercultural Camelot fantasy. She’s the princess with the cheekbones, the flaxen hair, and a musical gift that set birds in flight across the kingdom. And she is pursued over the years by a round table of eager suitors with guitars — David Crosby, Graham Nash, James Taylor, Leonard Cohen, Jackson Browne, and J.D. Souther among them. But she will not be owned, this visionary and uncompromising woman, and she will become the legendary ruler of House Blue. There are no new twists, no deeper layers of detail that might further ground some of Mitchell’s well-known experiences. This portrait doesn’t try to be definitive or challenging; it’s comfort food for fans who can’t get enough of her brilliant career. If you don’t already know the particulars of Mitchell’s story — her upbringing as the only child of conservative parents, her bout of polio at age 9, her discovery by Crosby, who took pleasure in introducing her to the likes of Eric Clapton and watching them melt as she sang — then Yaffe isn’t going to explain them to you. You might want to bookmark the Joni Mitchell Wikipedia page to supplement Yaffe’s account. At one point, as an example, Yaffe notes that Mitchell began writing after a dry spell after filming “The Last Waltz” in 1976. “She had been sick for some time, in and out of the hospital,” he writes, not bothering to explain much more about it other than a later reference by Mitchell to abscessed ovaries. Likewise, the most detail we hear on Mitchell’s long relationship with percussionist Don Alias — who was black, triggering Mitchell’s parents’ racism — is that he beat her up. Other boyfriends, including Taylor and Donald Freed, with whom she spent time after her divorce from bassist and producer Larry Klein, get even less attention, no matter how important they may have been to Mitchell and her work. Indeed, Mitchell’s bitterness surfaces repeatedly, particularly in her 2015 conversations with Yaffe, from her view of first husband Chuck Mitchell as her “first major exploiter” to her belief that Dylan was at times quite jealous of her. Some of her harsh comments are directed at Klein, as she and Klein argue through Yaffe about the circumstances around her 1986 miscarriage. But fans of Mitchell, now 74, are accustomed to her thunderhead of judgment, the way she wrestles with her ego. Her ferocity has helped her stay true to her creative vision all these years, despite the sexism all around her, and it has helped her redefine the role of women in music. The book ends in 2015, when Mitchell suffers an aneurism and lies unconscious on her kitchen floor for three days. But, as Yaffe has made clear, no one will be surprised if she finds her way back from disability, her stubborn defiance once again winning the day. This article has been viewed 1,609 times since being added on November 9, 2017.